By clicking on each event on each day (runs are in green and rides are in yellow, swims are in blue), you will get the location and details of the meet. Our calendar is updated as we add more meets and events. Where and when do we run? 3. Tuesday morning :5:15am meet at the Running Company. I know so early! but believe me, there is nothing better than a early morning run/walk with friends to start the day. Where and when do we ride? We meet twice a week to ride our bikes weather permitting. Please check the Facebook Group for announcements the day of the ride if the weather is uncertain. Any non member is welcomed to join us for one ride to meet the group and see how they like it! We will ask you to sign a waiver form before the ride. Wednesday 6:30pm at Bob Meyer Park Playground (called Medford Fort) parking lot. 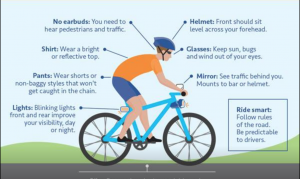 Please find a few basics rules to go by when riding! Safety first!